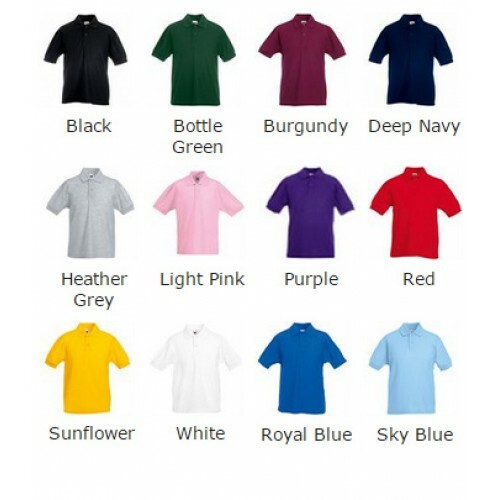 We at Embroidered polo shirts offer a huge choice in Fruit of the Loom brand. Its ideal for embroidery - this brand offer a huge choice in colour/size to cater for the work wear, printable industry. The Fruit of the Loom polo shirt is made from fabrication: Easy care 65% Polyester, 35% Cotton blend which is a quality weight of 180, GSM which is a good weight for Embroidery and printing. 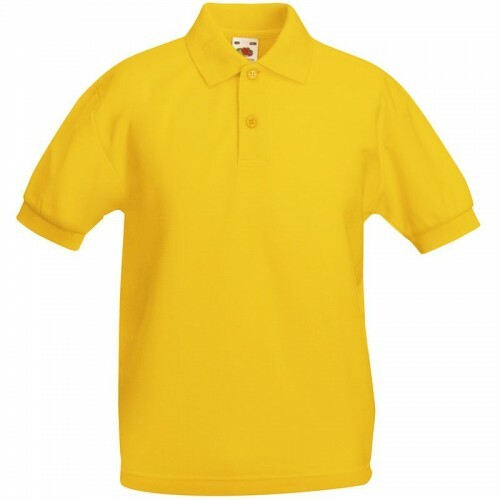 This Kids 65/35 pique polo Fruit of the Loom make has features - Guaranteed to perform at 60°C wash 3-button placket with self-coloured buttons Produced using Belcoro® yarn for a cleaner printing process sizes on offer are 3/4, 5/6, 7/8, 9/11, 12/13, 14/15 (26", 28", 30", 32", 34", 36") *Size 14/15 is VATable. This polo SS417 is on offer for quick delivery all over United Kingdom. For large orders in Fruit of the Loom brand then get in touch with us for trade prices in Fruit of the Loom manufactured clothing.